We focus on providing comedy for your children's shows with Family-Friendly Entertainment utilizing the highest standard sof moral content to perform for your kids. THEY improv is proud to provide educational and family-friendly shows for Faith-Based children. Learning becomes fun when in the hands of some top improvisational performers. Our 45-60 minute interactive family show entertains both kids and adults with spontaneous creation of material on the spot. The children learn the fundamentals of story telling and are involved in the creation of what happens on stage. Audience members also participate in the show and keep up the interest of everyone in attendance. Because the show is improvised, each performance is unique and tailored to the audience. These shows are extremely flexible and can fulfill your educational needs while remaining entertaining. Performances can take place in gymnasiums, theatres, lunchrooms, fields, libraries, or even the roof! Not only schools can take advantage of these performances. The shows are appropriate for day schools, temples, day care, summer programs, festivals, carnivals, or civic outdoor events. 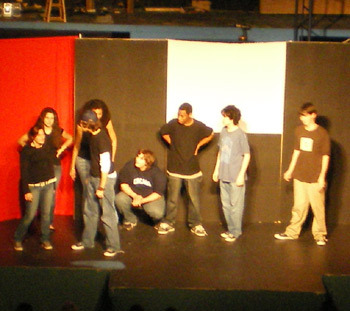 In addition to improvisational comedy shows, THEY improv also has a variety of youth-friendly murder mystery parties that will keep them entertained and having a great time as they work on problem-solving and personal-interaction techniques. Also, there are a variety of Faith-Based Game Shows available having the children compete for not-very-expensive prizes. Participating in Faith-Based events for charity, helping to educate our youth and simply making the community better is what THEY improv is all about. Simply contact us to find out how we can customize our show to your needs. You will be surprised at how entertaining, fun and cost-effective we can be.